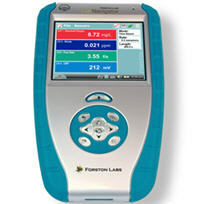 The Forston Labs Fracking Kit measures increased concentrations of barium ion, chloride ion, nickel ion, sulfate ion, bromide ion, potassium ion, turbidity and changes in acidity. The Kit consists of a LabNavigator (required for all measurements), a full-range heavy-duty pH Sensor, a Turbidity Sensor, a Conductivity Sensor and a clear-language informative user’s guide for the non-chemist. It works by simply connecting one or more of the sensors to the LabNavigator, ensuring the accuracy by using one of the included non-toxic standards, dipping the sensor into a sample of well water and pressing a button which stores the test results for future use. The digital readout on the LabNavigator shows the results in an instant.